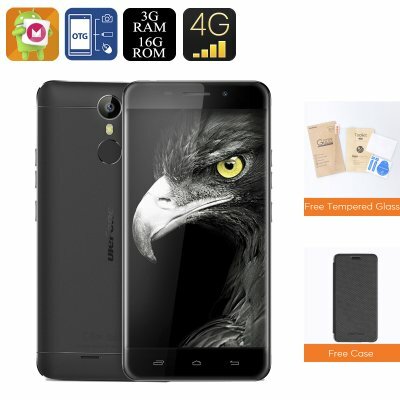 Successfully Added HK Warehouse Ulefone Metal Android Smartphone - Android 6.0, 4G, 5 Inch Display, Dual-IMEI, OTG, Octa-Core CPU, 3GB RAM (Black) to your Shopping Cart. Running on an Android 6.0 operating system the Ulefone Metal is guaranteed to deliver a smooth user experience and lets you enjoy the latest features that are currently available on the market. Featuring a beautiful 5 Inch IPS display this Chinese smartphone portraits all your movies and games in vivid colors and stunning detail – truly bringing media to life in the palm of your hand. So head out to the play store and download the latest Apps, games, movies and more to enjoy countless hours of entertainment – with this Android phone not a single moment of boredom will lay ahead. Supporting up to 16GB of internal memory and an astonishing 128GB of external storage space the Ulefone Metal is an Android phone that offers enough storage to securely save all your files, media, and games. Coming with a fingerprint sensor at the back of the phone this Chinese smartphone allows you to safely secure all your data and to easily unlock it by the touch of a finger. Additionally, its OTG feature allows you to connect external hardware devices such as a USB drive to your smartphone, further enhancing your overall user experience with this magnificent device. With its Dual-SIM and IMEI support the Ulefone Metal is the perfect smartphone on which to efficiently divide your work and private life. Additionally, it allows you to be connected to two different 4G providers simultaneously, immensely enhancing your online data coverage to ensure that, no matter where you are, you’ll always have the means to stay connected to friends and family. Coming with a SONY 3050mAh Lithium Battery this Android phone offers up to 8 hours of continuous usage time – enough to get through the most demanding of days without needing to fear about battery life.